Peradeniya Botanical Gardens These gorgeous gardens were first planned and laid out for King Keerthi Sri Rajasingha (1747-1780) and cover some 150 acres of trees, lawns and flowering shrubs, including a 50 acres arboretum of more than 10000 trees. 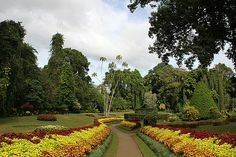 Under British rule, the royal park became a botanical garden in 1821 and is the largest of Sri Lanka's three mail botanical gardens. The best known attraction of the garden is the Orchid house, which has more than 300 varieties of exquisite orchids.